Photo by Dru Oja Jay, Dominion If built, the three other massive pipeline projects —TransCanada’s Keystone XL, Enbridge’s Line 3 replacement project Kinder Morgan’s Trans Mountain pipeline expansion project — would transport millions of barrels of oil per day from the Athabasca tar sands mines (pictured above) to refineries along the Canadian and US coast. But the work is far from over — three other massive tar sands pipeline projects representing millions of barrels of oil per day loom in the distance. Depending on who you talk to, there are a few explanations for TransCanada ending the billion-dollar Energy East project, which happens to be the second major pipeline project to be cancelled following the end of the $7.9-billion Northern Gateway pipeline in 2016. Theories include relentless resistance, especially from Indigenous communities whose traditional territories and waters were located on or near the pipeline route, as well as over-regulation by various levels of government and forecasts of a continuing dip in global oil prices and production that made the project less economically attractive. 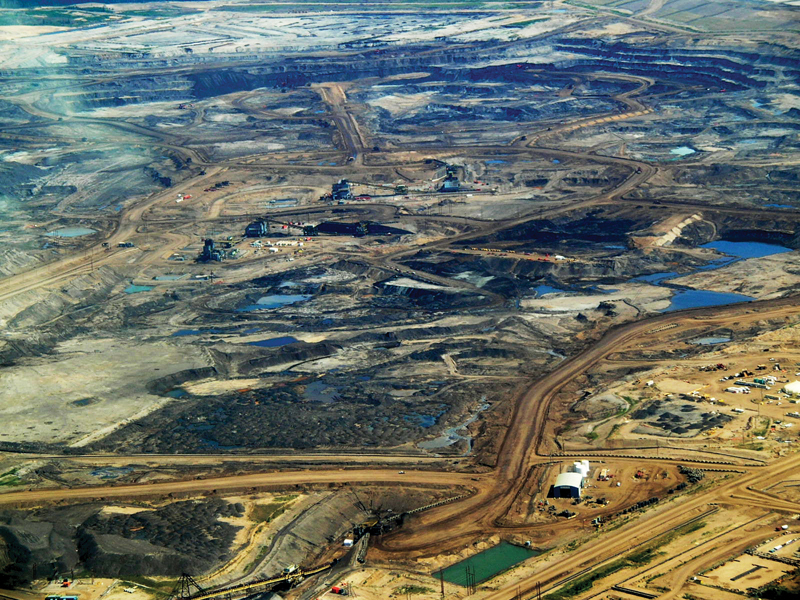 The Treaty Alliance Against Tar Sands Expansion, a coalition of First Nations and Native American tribes across North America attributed the pipeline’s demise to grassroots activism. “Both the Northern Gateway fight and this Energy East one show that when First Nations stand together, supported by non-Indigenous allies, we win,” Grand Chief Serge Simon of the Mohawk Council of Kanestake said on behalf of the Treaty Alliance. TransCanada, however, said the decision to abandon the project had less to do with the protests and land claims and more about not wanting to deal with a more stringent and unclear regulatory framework. There is little doubt that since the 2016 election of Prime Minister Justin Trudeau, Canada has stepped up its regulatory and environmental assessment efforts. Trudeau’s government made serious commitments under the Paris Agreement on climate change as well as to the rights of the country’s First Nations. For instance, the government required that both the upstream and downstream greenhouse gas emissions be considered during the approvals process for Energy East, and for all other pipeline projects in the country. Proponents of Energy East, including the opposition Conservative Party of Canada, criticized Trudeau’s government for bungling the pipeline project by piling too many reviews and regulations on TransCanada, and costing the country thousands of jobs and a massive injection into the economy. “Terrible news this morning about Energy East pipeline. Make no mistake, Justin Trudeau is to blame,” was the word from newly elected Conservative Party leader Andrew Scheer, the day the news became public. But Jim Carr, Canada’s minister of natural resources, defended the government’s position. “TransCanada Pipelines’ decision to cancel the Energy East Pipeline project was a business decision,” he said in a statement, emphasizing that three additional pipeline projects are currently either under construction or close to it: TransCanada’s Keystone XL; Enbridge’s Line 3 replacement project between Hardisty, Alberta and Superior, Wisconsin and American energy infrastructure company Kinder Morgan’s Trans Mountain pipeline expansion project. Global oil prices have indeed weakened since 2014, and as a result the forecast for future oil production has been lowered to the point where if all pipelines were built, there would be competition to keep them all at capacity. According to University of Alberta’s Andrew Leach, Canada will have more than enough pipeline capacity to handle future growth if the last three pipelines are completed. One of the pipelines is TransCanada’s Keystone XL, so why would the company want two of its own pipelines competing against each other? Or so the theory goes. This is exactly why anti pipeline activists are cautioning against complacence. “It will be a hollow victory if either Kinder Morgan, Line 3 or Keystone XL are allowed to steamroll over Indigenous opposition and serve as an outlet for even more climate-killing tar sands production,” Chief Simon said. Grassroots activists in Nebraska and Western Canada that will have much to say before any of these remaining pipelines gets built. In Nebraska, a regulatory body that will rule on the fate of the Keystone XL project this November. But even if approved, local activists have vowed to continue fighting it.. Meanwhile, despite being all but approved by the government, Kinder Morgan faces serious opposition to its Trans Mountain expansion, especially from British Columbia First Nations who have not given consent to the pipeline crossing traditional and unceded territories. Seven First Nations, two environmental groups and the cities of Burnaby and Vancouver have mounted a legal challenge against Trans Mountain and the case is currently being heard in court. And given that the new provincial government in BC won the election in part because of a commitment to fight the Kinder Morgan project, the fight seems set to intensify as all sides dig in for the final showdown. As hard as the oil companies push their agenda, there will be those who stand up and resist. With President Donald Trump rewriting the climate change denial handbook and pushing dirty coal like it’s a new miracle energy source, the world is waiting to see what happens in Canada. Will the Trudeau government greenlight the exploitation of the country’s massive fossil fuel reserves and move us farther and faster towards catastrophic climate change or will it be climate smart and stick to its Paris promises?